The Dunlop MSA British Touring Car Championship blasted into Scotland in style today (21 August) with an incredible parade across the Forth Road Bridge. The four current Scottish-based BTCC drivers – Gordon Shedden, Aiden Moffat, Glynn Geddie and Dave Newsham – all made the crossing in their flame-spitting machines, and were joined by a spectacular cavalcade of cars once piloted by the legendary Jim Clark, who won the BTCC 50 years ago. 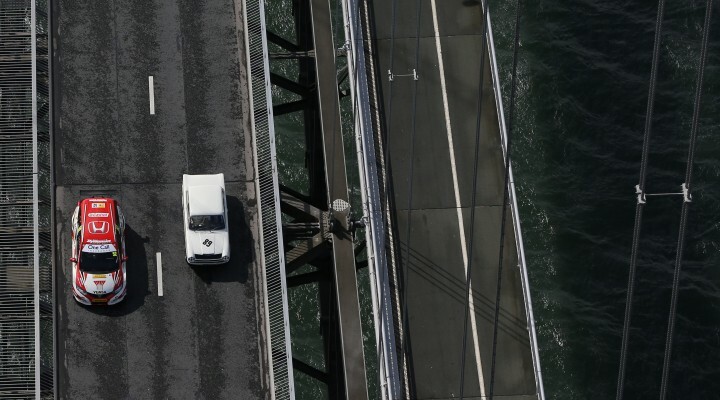 As the UK’s biggest series makes its annual trip north of the border, the world-famous bridge was closed to celebrate Clark’s achievement, and the very Lotus Cortina he drove to championship glory back in 1964 went over the bridge alongside Shedden’s current Honda Yuasa Racing Civic Tourer. The Forth Road Bridge was also celebrating its own 50 years in operation, whilst Knockhill circuit is marking its 40th anniversary throughout 2014. The leading pair of cars were followed by Moffat’s Chevrolet Cruze, Geddie’s Toyota Avensis and Newsham’s Ford Focus, all of which roared over the famous structure just behind an amazing Jim Clark Lotus F1 car. An impressive turnout of passionate fans came to see off the cars from the staging area south of the bridge, with many more lining the roads to see the fantastic spectacle unfold. The Firth of Forth rang out to the sound of racing engines in anticipation of the 31-car spectacular that will take to the Knockhill circuit in Fife this weekend. As well as the current stars, another Scottish legend – double BTCC champion John Cleland – also joined the parade in a DKW, adding yet more celebrity sparkle and automotive history to the event. The four modern BTCC cars have now joined the rest of the 2014 line-up in the Knockhill paddock ahead of a weekend of flat-out racing action around the challenging 1.27-mile circuit. Local hero Shedden has already won three times at his home venue and he’ll be hoping to add to his tally as he looks to hunt down championship leader Colin Turkington this weekend. Laser Tools Racing driver, Aiden Moffat, said: “This event has been absolutely fantastic. It’s great for Knockhill and for Scottish motor sport in general. I’m excited to be home and racing up here again – I started my BTCC career at Knockhill last year and I’ve come on a long way since then. It’s the best I’ve ever felt in the car and the best the car has ever been, and to be kicking off the weekend taking part in a bit of BTCC history is the perfect start. United Autosports driver, Glynn Geddie, said: “It’s good to be a part of such an important event – the turnout from fans and media has been mega and obviously it’s something I’ve never done before! I’m proud to be here – there will be a lot of people coming down to support me from Aberdeen this weekend which is always good. We’ve got a lot of work to do but I’m looking forward to racing at Knockhill again – I’ve not driven the circuit in a few years so it’ll be good to get back out there. Former double BTCC champion, John Cleland, said: “This is celebrating the life of a star – no matter what Jim Clark drove, he would win. I think Knockhill have done a fantastic job of raising the profile of this event by somehow getting the Forth Road Bridge – the main arterial road between the north and south of Scotland – closed for the parade. I still closely follow the BTCC, I’m actually racing myself this weekend in my 1997 Vectra, but I’ll definitely be watching the races because Knockhill always provides some great racing, especially if it rains!